Public meetings are being held to allow people to have their say on proposals to shut Shropshire's ambulance control centre. West Midlands Ambulance Service is considering closing the call centre and moving the work to Brierley Hill, in the Black Country, or Stafford. This week ambulance leaders will be holding question and answer sessions in Shrewsbury and Telford. They have said the move would make the service more efficient. 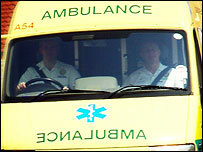 Ambulance leaders have denied it would be a cost-cutting exercise. Earlier this month, three workers from the ambulance service were suspended over allegations of breaching the Data Protection Act.